When people talk about bodybuilding and even simply weight and strength training in general for that matter, they generally think of exercises involving heavy weights or machines: deadlifts, barbell rows etc. Whilst these types of exercises are great for training the back, there is one exercise that is considered to be hugely beneficial, even more so than the examples listed previously, and what’s more is the fact that it requires nothing but your own bodyweight. The exercise in question is the humble pull up or chin up. Here’s a look at the slight differences and variations of the two, as well as how they’re performed. What’s the difference between a pull up and a chin up? The main difference between chinups/pullups is the types of grip that are being used. Pull ups are considered the most beneficial for working the back, and by adjusting your grip to a wider one, one that is wider than shoulder width, you can even target the different areas of the back. Chin ups target the lower lats but they also work the biceps due to the close underhand grip. 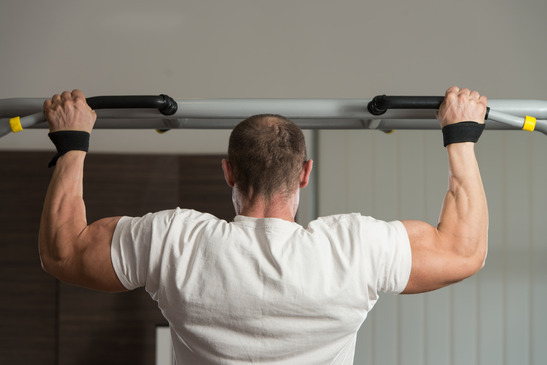 Chin ups are considered a great example of a compound exercise as they work both the arms, and the back at the same time, so for that reason here’s a look at how they’re performed. Grab a chinning bar with a underhand grip closer than shoulder width apart, and make sure that your palms are facing towards your body. Fully extend both of your arms whilst maintaining the grip on the bar, and stick your chest out slightly, and keep your body perfectly straight. Keep your body as straight as you possibly can, as this can help to really bring the biceps into play. Exhale and slowly pull your entire body up off the ground until your head is just higher than level with the chinning bar. Really focus on making your biceps do the work with this exercise and avoid rocking your body to gain momentum. You should make sure that your forearms are doing no other work than simply holding the weight of the bar as you pull yourself up. At the top of the movement, squeeze and contract the biceps and the back for a second or two, and then slowly lower yourself back down to the starting position until your arms are fully extended once more. Repeat for as many repetitions as required. By the end of the exercise your biceps and your back should both feel tight and pumped as nutrient rich blood should now have rushed into them. 63 views7 Reasons Why You Are Not Ripped Like You Could Be!